Poa are a group of grasses are a widespread species coming from Europe, Asia, America and New Zealand as well as Australia. It is the native species that are most widely used in landscaping. Chosen for the tough easy care nature they are a favourite with landscapers. Some are suited to moist areas, however most used in dry areas. In Australia Poa are commonly referred to as ‘Tussock Grass’. Poa Grasses are available for sale from online Nurseries, Mail Order Nurseries, Specialist Nurseries as well as Retail Nurseries. P. Labillardieri or ‘Large Tussock Grass‘ is a clumping species to nearly 1m with grey-green leaves. Hardy, frost tolerant and drought tolerant this species is great for borders and landscape plantings. 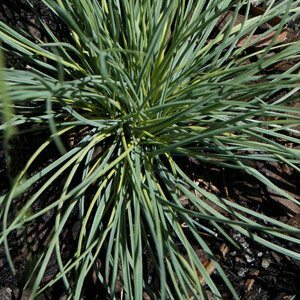 P. australis or ‘Blue Tussock Grass’ is a smaller growing species approx 30cm. and like all Poa is attractive to birds. P. sieberiana is the ‘Grey Tussock Grass’ or ‘Snow Grass’ and is found in Queensland, New South Wales, Victoria and Tasmania with main concentrations in southern areas. P. morrissii or ‘Velvet Tussock Grass’ can be cut back to keep it in shape. P. clelandii has nice purple flowers. P. ensiformis is the ‘Purple-Sheath Tussock Grass’. Sometimes referred to as ‘Snow Grass’, Poa sieberiana var. cyanophylla (pictured right) with its silver blue green foliage is relatively low growing to around 20cm in height. It will spread to form a clump of around 30cm. Growing well in full sun to part shade this is a useful ornamental grass for use as a border, in mass planting or for under planting native tree. Frost tolerant and grows well in dry conditions once established. Not suited to humid sub tropical or tropical conditions.